Details about James Gandolfini’s final moments come as a photograph has emerged apparently showing the actor enjoying an evening out with his son Michael the night before his sudden death. In what could be the last picture of the award-winning actor, James Gandolfini appeared at ease and in good health as he ate dinner at the Sabatini Restaurant with his son Michael, according to fellow holidaymaker Blake Kahn, who took the photo. 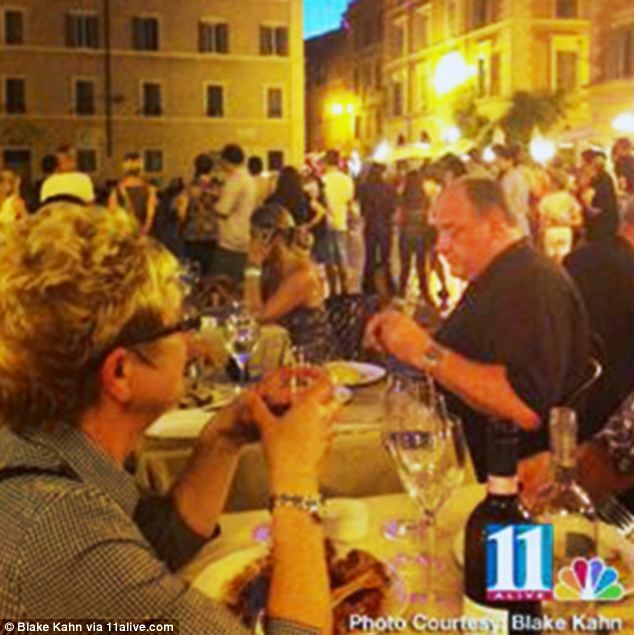 Another member of Blake Kahn’s group, Dee Duncan of Roswell, Georgia, added that James Gandolfini looked as if he was enjoying the “magical atmosphere” as jugglers and magicians performed in the square. Blake Kahn, from Atlanta, Georgia, later shared the images with 11Alive. James Gandolfini was on vacation in Rome with Michael, wife Deborah and their nine-month-old daughter Liliana to “reconnect with his Italian roots” before the Taormina Film Festival in Sicily. James Gandolfini’s Sopranos colleagues have led tributes from the showbiz world, with the show’s creator David Chase who compared him to Mozart, praising him as “one of the greatest actors of this or any time”.